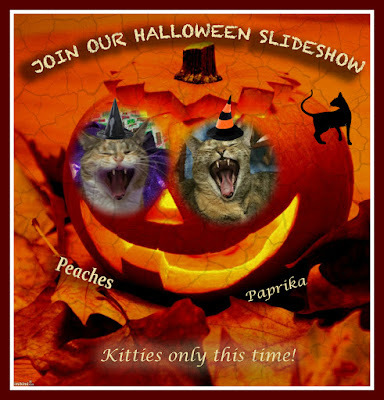 Peaches and Paprika: Still time to join our Halloween slideshow! Still time to join our Halloween Slideshow! (our fangs will be longer by then!) October 28 is deadline! To enter, just post your link or email it to me at carollowbeer@comcast.net. Today we are joining Cat On My Head's Sunday Blog Hop. Wow, you pumpkin sure is scary. I will have mom send a photo so I can be in your Halloween slide show. I would love to do that. I won't be the cow though. Thanks for inviting me. Oh that is a furry scary pumpkin! 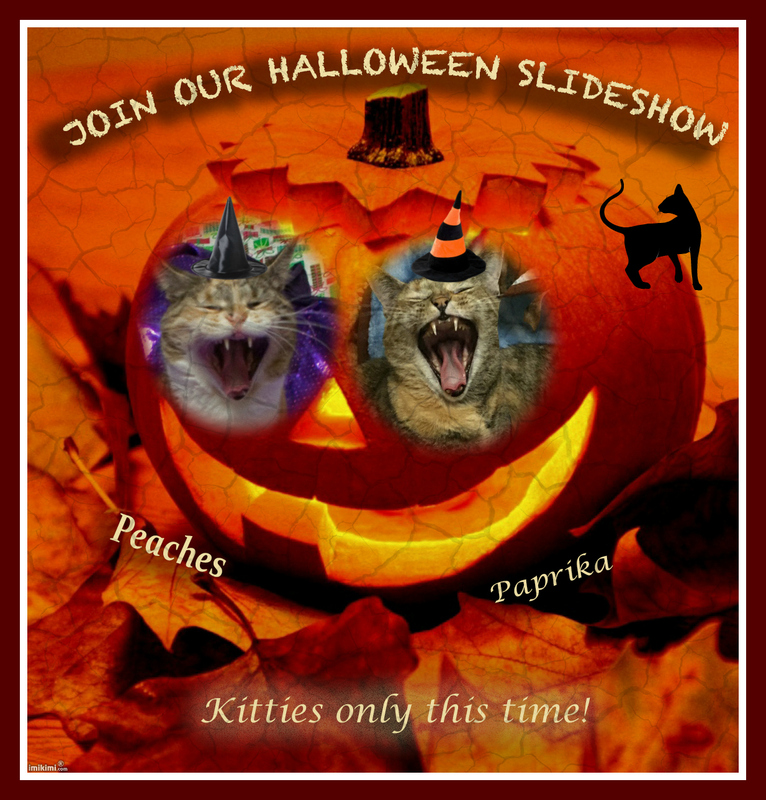 We will send a photo to be included in your Halloween Slide show, can't wait to see it! I don't know where mom put my TCC list and I wanted to see if you are in the Tabby Cat Club? If not please join up. We would love to have you. If you are a member and think it strange that I don't remember it is because we have so many it is hard to keep track of everyone. Love the two fang shots! We need to get our furs together and send in our pictures for the slideshow! Nice fangs :) Do you brush your teeth? WE always love your slideshows! We'd love to join in on your Halloween slideshow! Our purrsonal assistant will email you some photos--you can pick your favorite(s) and we are certain will will be entertained by your show...spooky & fun & full of felines! Can't wait to see Fergus and Popoki in the slideshow. Thanks for the invite!